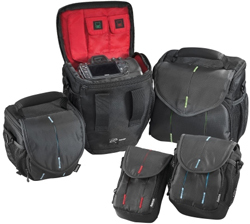 Hama has released new Canberra camera bags with a colourful inside. The camera bags come in nine different sizes and are all black on the outside and have a coloured inside. Two of the models are for DSLR camera, while three are for compact and video cameras, and four models can hold medium sized cameras and equipment. The prices for the Hama camera bags start at about €20. At a superficial glance, the new Canberra camera bags from Hama are black with subtle colour accents. Upon closer look, you notice the colourful interior, practical equipment, and a lot of well-conceived details that support the notion of “fashion meets design”. The nine different-sized models in the Canberra series offer something for every taste: three versions for compact cameras and video cameras, two practical colt cases for SLR cameras, and four models that can hold medium-sized camera equipment with varying amounts of equipment. Soft handles, sturdy carrying straps with metal clip and soft shoulder padding, side mesh pockets, a document compartment on the back, rubberized feet, integrated rain cover, padded interior with coloured lining – the list of Canberra equipment goes on. Hama has also provided organisational features. Small pictograms show you where to find the empty batteries, where the charged batteries are, which compartment holds the memory card, and where the rain cover is stored. Everything is arranged so that you can access your equipment quickly and easily when you take pictures. 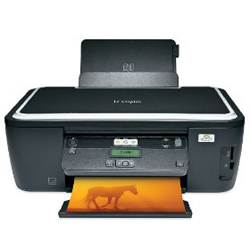 CNET UK has reviewed the Lexmark Impact S305 printer. This Lexmark is an all-round printer that let you print, copy and scan. Lexmark claims that the printer is able to produce borderless 4″x6″ photos in less than 24 seconds. CNET UK ends up giving the Lexmark Impact S305 a “Good” 6.5 out 10 rating. The reviewer find it to be a very good all-round printer that make excellent text output, but the scanning feature could be better. Read the full review of the Lexmark Impact S305 printer here. Canon has announced a new professional DSLR camera called Canon EOS-1D Mark IV. There are several improvements compared to the 1D Mark III like a new CMOS image sensor with more resolution (16.1 megapixels) and the ISO range is expanded to an impressive ISO 102,400. 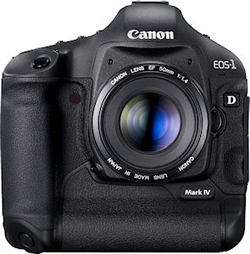 The Canon EOS-1D Mark IV will be released in December 2009 and cost about $5000. The EOS-1D Mark IV, EOS HD Video Powerhouse Over the past year, Canon’s EOS HD Video technology has changed the way users capture 1080p HD video and opened new doors for multimedia journalists and Hollywood cinematographers alike with full manual exposure control, selectable frame rates, and interchangeable lenses on some of the largest and most sensitive image sensors on the market. Canon continues this innovation trend with the new EOS-1D Mark IV Digital SLR with Full HD capture and full manual exposure control, plus selectable frame rates on an all-new APS-H-sized image sensor that’s similar in size to a Super 35mm motion picture film frame. The large sensor allows filmmakers to achieve shallow depth-of-field just as cinematographers have traditionally done using much higher-cost motion picture equipment. Minimize Post-Production with Enhanced Canon Auto Lighting Optimizer Action photography truly is all about speed, capturing a fast subject with fast focusing and fast frame rates. However, all this speed might be wasted if it is slowed down by lengthy post-production procedures to adjust image quality. The EOS-1D Mark IV Digital SLR helps reduce post-production work with a powerful new Auto Lighting Optimizer (ALO) system. When enabled, Canon’s ALO automatically adjusts the image for optimal brightness and contrast on the fly during in-camera image processing, reducing clipped highlights while keeping shadowed areas as clear and detailed as they actually appear. By optimizing brightness and contrast in-camera, Canon’s ALO system significantly reduces the need for post-production image optimization, and gives photographers image quality they can take directly to press. Demanding professional photographers who tested ALO clearly stated that this one feature will reduce their post-production image optimization process by more than 75 percent. Canon’s ALO works with both RAW[i] and JPEG images as well as video recording. Canon U.S.A., Inc., is a leading provider of consumer, business-to-business, and industrial digital imaging solutions. Its parent company, Canon Inc. (NYSE:CAJ), a top patent holder of technology, ranked third overall in the U.S. in 2008†, with global revenues of US $45 billion, is listed as number four in the computer industry on Fortune Magazine’s World’s Most Admired Companies 2009 list, and is on the 2009 BusinessWeek list of “100 Best Global Brands.” Canon U.S.A. is committed to the highest levels of customer satisfaction and loyalty, providing 100 percent U.S.-based consumer service and support for all of the products it distributes. At Canon, we care because caring is essential to living together in harmony. Founded upon a corporate philosophy of Kyosei – “all people, regardless of race, religion or culture, harmoniously living and working together into the future” – Canon U.S.A. supports a number of social, youth, educational and other programs, including environmental and recycling initiatives. Additional information about these programs can be found at www.usa.canon.com/kyosei. To keep apprised of the latest news from Canon U.S.A., sign up for the Company’s RSS news feed by visiting www.usa.canon.com/rss. When processed in Canon Digital Photo Professional software. 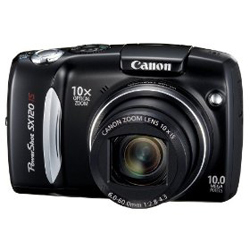 Digital Camera Review has tested the Canon PowerShot SX120 IS digital compact camera. This Canon compact contains 10 megapixels and 10x optical zoom. Digital Camera Review ends up giving the Canon PowerShot SX120 IS a good review especially if you do not own the earlier SX110. The SX120 has good optics, manual controls, good image quality and a big LCD screen. On the downside we find a bit of purple fringing and chromatic aberrations, and some noise at higher ISO levels. Overall this Canon camera seems like a good choice. Read the full review of the Canon PowerShot SX120 IS camera here.